Build your own apps, no coding required. Enjoy world class features as standard and view data in beautiful charts. Softools is a web-based application platform where off-the-shelf and custom apps can be designed, built and deployed in hours. 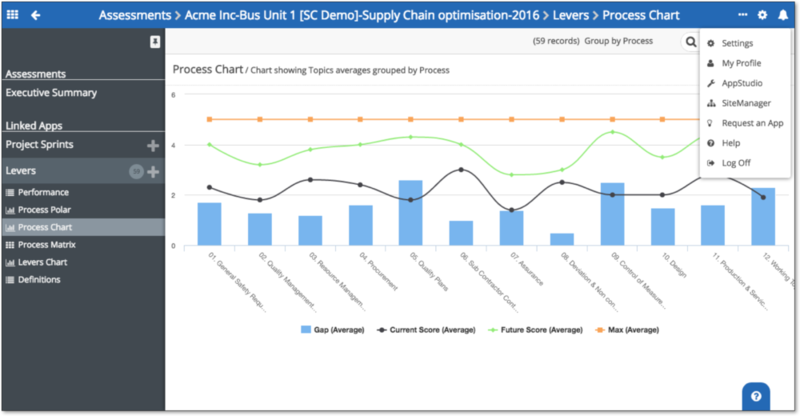 Process chart example showing data over time, or data grouped by team, process or function. All Charts offer: drill-down and zoom options, and can be filtered as required. The Bubble diagram provides a visual chart of a portfolio of records. All Charts offer: drill-down and zoom options, and can be filtered as required. The Spider diagram (or polar chart) shows grouped record values. All Charts offer: drill-down and zoom options, and can be filtered as required. The Monte Carlo chart allows complex scenario analysis for business risk and opportunities to be completed. All Charts offer: drill-down and zoom options, and can be filtered as required. With Softools, all features come as standard. 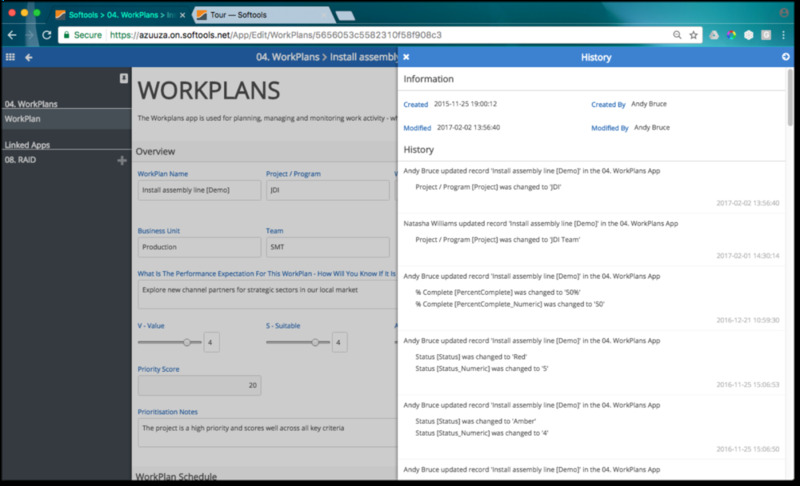 Features are turned on and off as required - allowing local Administrators to configure apps and features to the needs of individual teams as required. Apps are also instantly secure and scalable, and accessible from any device running a modern web browser from PC to smart phone - anywhere anytime. Visibility and tracking of data is critical to any enterprise system. The Audit Trail provides a full history of what changed, what values, and when on all records. The platform will also allow users to be notified via email, SMS or Slack if changes to selected fields have been made. 24/7 support is available though the online Help Centre accessible from the Process and System Help buttons on each site. Process Help explains how each app works and System Help explains how to use system features. The Chat Room feature on all apps also allows users to share share ideas and insights with colleagues. The Softools platform has been designed with the user in mind. A great User Experience encourages and motivates users to want to use the system. The ability to operate how and when the user wants is key to long-term use. Clients want apps and solutions that reflect their ways-of-working - bespoke solutions BUT without bespoke code. This is achieved through the zero-code configuration capability available within the integrated App Studio. Sites are also reflective of client logos and colour schemes. The Softools platform has 'published APIs' that allows you to connect and exchange data with internal systems such as SAP. All apps can therefore run in stand-alone or integrated format. Softools is fast to build, fast to deploy and fast to use. Apps can typically be built in hours and instantly deployed at the click of a button. The 'off-line' capability will also make systems as fast as apps running on your PC or smart phone. Data security is critical. Your data is hosted on the Microsoft Azure hosting platform - the world's most secure and scalable hosting platform in the world. Softools is a Microsoft Partner, and we work closely to align and integrate emerging web technologies. You no longer need to be a IT developer to build apps. 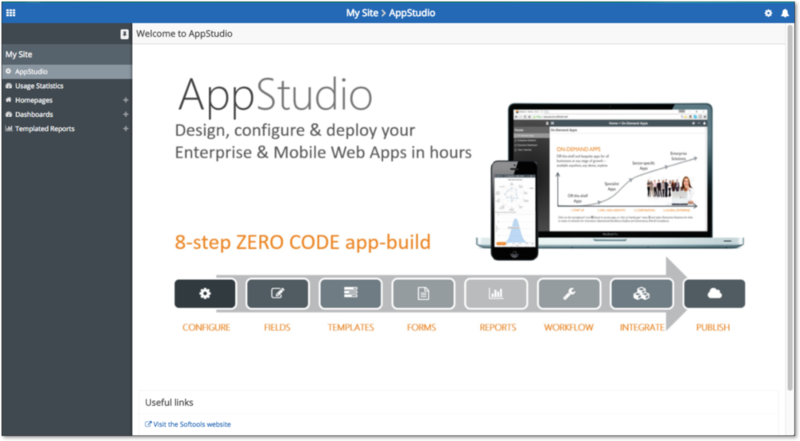 Use the Softools zero-code App Studio to design, build and deploy apps in hours. Simple and complex apps can be created that work in stand-alone or integrated format. The Softools platform can be scaled to enable 1 million users and 1,000s of apps running in a single solution. We can also deploy solutions anywhere in the world at the press of a button. All apps built on the Softools platform will automatically run on any device from PC to Tablet and Smart Phone. App will also be available off-line - allowing users to operate in environments where internet bandwidth is very poor or even non-existent. Data can be exported from a record or report in both csv (data table) and Microsoft Word where output documents can be formatted with logos, colours and formatting. This feature allows data to be shared with non-system users. Data can be entered into the system in three ways: 1) manually directly into the data input fields in the web forms, 2) using csv import-export interface documents, and 3) via the published APIs that allow real-time data exchange with third party systems of IoT devices. Permissions determine what a user can do (e.g. build applications, configure reports or add users) and Security determines what a user can see (e.g. read-only, read-write access or no visibility to records). Across all apps you have the ability to attach all types of media: images, videos, PPT, Word documents, PDF documents - simply drag & drop from your PC, tablet or smart phone. 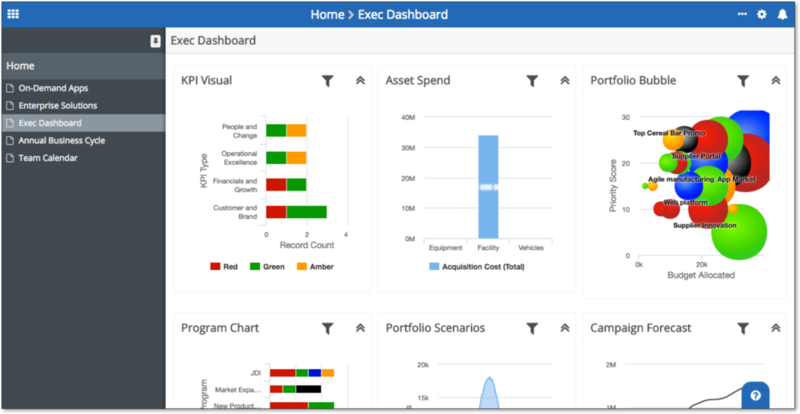 Softools offers a rich and flexible dashboarding and reporting capability. Choose from over 30 different chart types (e.g. Bubble, Gantt, Monte Carlo, Bar, Line...) to visualise and showcase your data. New Softools sites can be set-up anywhere in the world in hours. Solutions run on the secure and scalable Microsoft Azure global hosting platform with servers located in all regions including North America, Europe, Asia, Australia and China. Users can also operate in any language.